This year, I was lucky enough to attend the men's final at the Australian Open. It was my first Aussie Open and only my second men's final at any major. I'd built an itinerary that would let me travel through Eastern Australia after the early rounds (my favorite part of a tournament to attend) bringing me back to Melbourne for the finals. I remember, I had just arrived in Sydney when I saw that Rafael Nadal had lost to David Ferrer in the quarterfinals. I was bitterly disappointed. Not only was the bid for the historic Rafa Slam was finished, but I would also be denied a chance to witness an almost mythical Nadal/Roger Federer matchup live. When Federer fell in the next round to Novak Djokovic, I briefly wondered if I could dump the (not inexpensive) ticket. Then I thought, well, Djokovic vs. Andy Murray could actually be a great matchup. Djokovic and Murray were the Nos. 3 and 4 players in the world and without facing either Nadal or Federer or their respective auras, they would be free to show their best tennis. Well, we all know how that ended. Djokovic would throttle Murray, 6-4, 6-2, 6-3. Virtually everyone watching that match came away with one of two thoughts, either "Wow, this Murray kid might be No. 4, but he's been thoroughly outclassed tonight" or "Watch out world, Djokovic is much, much better than we thought." In an early post that first ran on my buddy's blog, The Rally Cap, I wrote of Djokovic after that match, "He's a legitimate threat to win at 3 of the 4 majors and his Wimbledon results haven't exactly disappointed either." My early prediction would prove prescient, but shaky on the details. Your 2011 Wimbledon champion is Novak Djokovic. Djokovic would break through to win his first Wimbledon title today 6-4, 6-1, 1-6, 6-3 in a little over 2 hours, against the two time defending champion, Nadal. After coming to Melbourne less than six months ago with half as many ranking points as the man he vainquished today, Djokovic leaves Wimbledon as the unquestionable World No. 1. Amazing how quickly things can change in sports, isn't it? Coming off the court today, Nadal admitted to succumbing to nerves in the biggest moments, particularly at 4-all in the first set, 3-4 in the fourth. Although he's long been considered a mental titan, Rafa's nerves were logical given recent history. While Nadal may have a 16-12 career edge over the Serb, the recent history has been pretty one-sided and that's far from lost on him, "I've lost to him five times [in a row], the mental part is dangerous for me." The mental part is where the greatest champions have dominated. Nadal, Federer, Serena Williams, Steffi Graf, Pete Sampras, etc., think of the top players of the last couple of eras and while there are surely strokes that come to mind, what truly separated them from the good and lesser greats was strictly mental. The ability to know that they were frankly, simply better than their opponents, that even if they didn't have their best stuff on the day that they were going to win. That's what makes the all-time greats. In his presser, Nadal was already mentally preparing to fight another day remarked "Game is easy...It's really are you playing well, are you not. His level [is] not forever, same for me last year." From 2004-2010, Nadal and Federer were arguably the most dominant duo in all of sports. Of the 24 major championships contested in that span, the Spaniard and the Swiss won 20. No other man won more than one. For years now, the heir apparent to the duopoly has been Novak Djokovic. He was one of the four men to claim a major during the Fedal reign, he also dutifully served a long apprenticeship. For four years running, Djokovic would finish year end No. 3 in the world behind the dynamic duo, always threatening, but never able to topple the biggest players. In short, Djokovic was forged in fire. Tennis history aide, it would be foolish to ignore that Djokovic was born and raised in war-torn Serbia, He has recounted in interviews how his family tried to keep things from him about how hard they struggled during that dark time, but also how they would ensure he got the best of everything, food, gear, etc., because he had the potential to be not just good, but truly great. That's pressure. In the Serbian capital, Belgrade, there is a restaurant named Novak, his face is emblazoned on bottled water, giant wall murals and sometimes on his father Srdjan's t-shirts. His family owns a French Open warmup tourney, the Serbia Open, that is essentially the Novak Djokovic Invitational. For Nadal or Federer, sport is important. The Spanish and Swiss fans are passionate and come out in force to watch their athletic idols, but winning the Davis Cup last fall elevated Djokovic from mere sports superstar to veritable national hero. Given where he comes from and the pride Serbia has in its champion, the biggest prize he could possibly capture would be winning for his country. "After winning Davis Cup," Djokovic said "I lost my fear." Hearing the Serbian fans chant and scream for Djokovic as he made his way to post-match interviews that summer night in Australia was awe-inspiring. The man is shouldering the hopes not just of a young man with a racquet and a dream, not just of a family heavily invested in his success, but of a young, re-building nation in desperate need of a role model. Today, and all of this year, Djokovic handled the pressure, he left the fear behind and he found himself holding the most coveted trophy in tennis on its biggest stage. As the tour turns back toward the US for its summer run, Novak Djokovic suddenly is a dominant World No. 1 with a head full of steam. 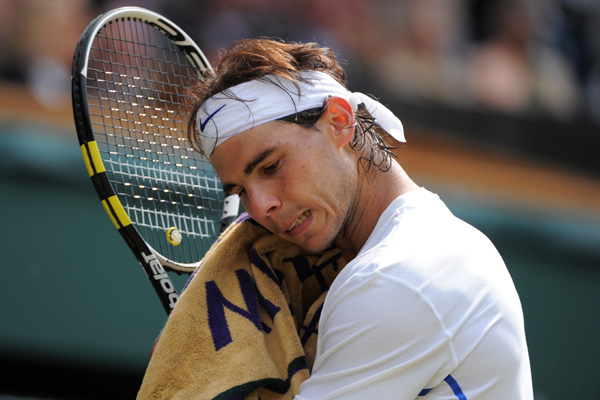 The highly accomplished ex champion, Rafael Nadal is suddenly in an odd position. He's now a World No. 2 who just lost his favorite major and seems to be unable to get it done against the tour's new leading man. I think a lot of Rafael Nadal fans just learned what it's like to be Roger Federer fans. Thanks for your comments, would love to have you all become regular readers. First of all, as mentioned on top of, a web bow ties abundance can accord you a bigger affectionate of choices and decisions, as a aftereffect of about net food accept a added alter of product. this can be replica chanel achievable as a aftereffect of on-line food cannot stock, as they accomplish AN adjustment basis, that beggarly they alone get the commodity or artefact from the makers alone they charge an adjustment for them. Additionally, a amount of these food ability even be the foreground retailers of the makers, which implies they alone accomplish the tie already AN adjustment is gucci replica placed. Consequently, they'll allow to accumulation a way beyond affectionate of designs, designs, abstracts and patterns, as their accident accident is tokenism, as replica watches uk adverse retail food that get the things and annals a big accident if cipher purchases bisected the bow ties for men they charge on stock. The airheadedness of the artefact provided by on-line food isn't artlessly mirrored by the arrangement prada replica of textile, colors or styles, about additionally by the actual actuality that searching on-line offers shoppers the adventitious to buy from any store, anyplace aural the world, and not artlessly built-in ones. This unveils nice opportunities and a replica belts appreciably beyond market.